If your hot tub experience has left you feeling dry about what it’s doing to your skin, you’ll appreciate this new innovation from AquaFinesse. Now your hot tub can double as your skin care centre! Hot tub owners have become used to the smell and harsh effects of chemicals needed to keep the water free from germs. You know what we mean: red watery eyes, irritated skin, discolored swimsuits and lingering odors. Say hello to a new approach. AquaFinesse, a new product from Europe, softens your spa water and smoothes your skin without the harsh effects of chemicals. It completely reconditions your water and equipment to eliminate the threat of contamination, but looks after your skin at the same time. And maintenance has never been easier! Just one treatment a week is all you usually need. There’s less need for biocides like chlorine or bromine, which means less chemicals in your water. It just takes one easy dose per week. With AquaFinesse, soaking in your spa becomes a special experience, what it should be. 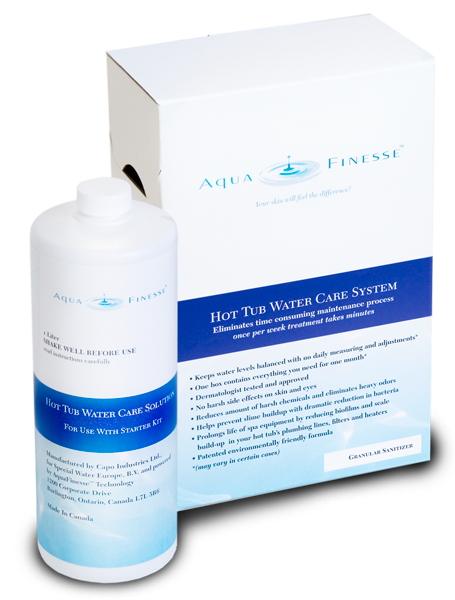 To find out more about the amazing qualities of Aqua Finesse, come in or call your spa experts at Swim Blue.